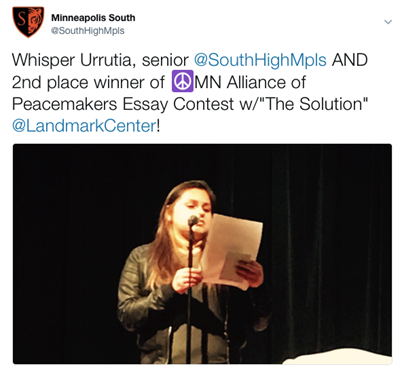 In conjunction with World Story Telling Day, March 21, South senior Whisper Urrutia was asked to recite her prize winning essay, "The Solution." The event, which recognizes that stories tranform education, and contest were both sponsored by the MN Alliance for Peace. Urrutia did South High proud, claiming 2nd place and $750 scholarship prize.